The Lake Thun Right-Bank Railway. A Crocodile Gets Back to it’s Roots. By “V-Bahn” to the Top of Europe. By Cable Car to the Skies. 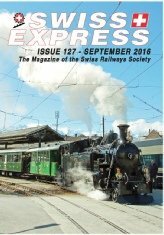 In Praise of the Swiss Railway System. The MIB and a Walk through the Aare Gorge. The Final Year of the Gotthard. 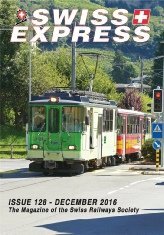 Highlights of the Glacier Express. All Change at St. Gallen. BVB Line 8 to Weil am Rhein. Two Perspectives of Le Locle. New Coaching Stock for Rhätische Bahn Albula Line on Test. 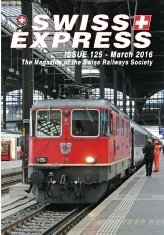 Sau.rer – A Swiss Success Story. Old Notebooks and a shaky Memory! Roger Ellis Offers an Opportunity. 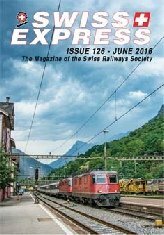 Gotthard Base Tunnel – Ist June 2016. 1941 –2016 75 Years of Luzern Trolleybuses. M/s Rigi – Luzern’s First Floating Art Gallery. 40 Years of MOB Panorama Cars. Trains and Boats and Balloons. Postcards – A Short History. Bern Gets a Lift – or Two. Times Past – The “Landi”. A Trip to Chiasso Depot. The Land of the Geriatric Hiker. The Rigibahnen – Always Upwards. Variations on a Theme by Stadler. The “New” Pranzaira –Albigna Cable Car. Times Past – ”Blauer Pfeil”..
Station to Station Walking the BOB. The New BLS Class Re475 “Vectron”. Built by Beer – Powered by Sewage!. Steam Shortage on the Furka. Summer Notes from the Graubünden. New Life for an Old Lady.